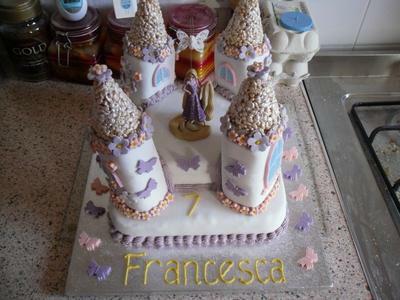 I made this cake for my God daughter Francesca's, 7th birthday. She was mad on the 'Tangled' film, so a castle was very apt. I baked 2 10" Vanilla cakes and 2 8" vanilla cakes, and filled them with a pink vanilla buttercream (got to keep up with the girly theme, hence the pink buttercream). I cut the corners away from the 8" cake to allow for the towers. I iced the 2 sponge sandwiches with white icing, and also iced 4 swiss rolls with the same fondant. I used 4 'screwball' containers to mold the turrets, for which I used Rice Krispies and white chocolate, then dusted them with shimmer luster dust, to give them a sparkly effect. i colored some fondant and cut out window shapes for the turrets to give multi level tower effect. I used a plunger cutter to cut and imprint butterflies and cut different colored flowers. I built the cake up and secured the towers in place with plastic dowels for cake making. The turrets were mounted on the swiss roll towers using royal icing, and all the joins were piped with buttercream. I decorated the towers with the windows, butterflies and flowers, all secured with royal icing. I then placed a shop bought 'Rapunzel' doll on the top. My God daughter loved it, this cake was the talking point of her birthday party, and I enjoyed every minute of making it. The best cake I've seen in my life!!! What a fantastic cake!! My daughter would go nuts for this cake! What can I say??? STUNNING! THAT IS SO PRETTY AND A REAL GIRLIE, CAKE, WHAT LITTLE GIRL WOULD NOT WANT A CAKE LIKE THAT? VERY GOOD WORK AND WHAT A GREAT TALENT YOU HAVE, KEEP IT UP!!! The detailing is brill.....i want one!!!! This cake not only looked fantastic but tasted fabulous to!